The Major Mitchell's Cockatoo is the only cockatoo with a multicoloured crest. C.l. leadbeateri: Male-white cockatoo with pink face, nape, chest and belly; brilliant red and yellow streaks in white crest. Dark pink forehead. Eye dark brown. Female-paler pink, wider band of yellow in crest, upper abdomen white instead of pink, eye reddish pink. C.l. mollis: Both adults as in leadbeateri, but crest darker red with little or no yellow. Bill both races white. Immatures similar to adult female with paler head and underparts. High note, quavering. Harsh alarm call. Fledglings wheeze when calling for food. Common in Australia, less so elsewhere. Walk-in cage, minimum length 4.5m (14.7 ft). Mix of small seeds: canary, oats, safflower, limited sunflower, spray millet. Sprouted sunflower, beans and lentils; green leaves such as: spinach, Swiss chard, lettuce, sowthistle, dandelion, chickweed; fresh vegetables such as: corn, carrot, celery, zucchini, green beans and peas, fruit if taken; nuts such as: walnuts, hazenuts, pecans and roasted peanuts. Complete kibble. Avid chewers so provide bird safe, unsprayed wood (fir, pine, elder, willow), wood toys, vegetable tanned leather toys, heat sterilized pine cones. Also provide overhead misters or shallow water bowls for bathing. Hollow log or vertical box with trap door. Loss of habitat and because it is an ecological specialist it has faced downturns in its population with poor recovery potential; also trapping for wild bird trade. Serious decline in Victoria area. C.l. leadbeateri: Interior of SE Australia from SW Queensland and W New South Wales to NW Victoria and CE South Australia. C.l. mollis: Inland W and C Australia east to Eyre Peninsula and Lake Eyre basin, S Australia. Mainly found in arid interior of Australia, favouring Eucalyptus woodland around rivers and ponds, also mulga, mallee, cypress and Acacia woodland, as well as farmland. Up to 300m (984 ft). Grass seed, paddy melon seed, figs, pine cones, Eucalyptus seeds and bulbs, bitter wild melon seeds, nuts, roots, insect larvae. 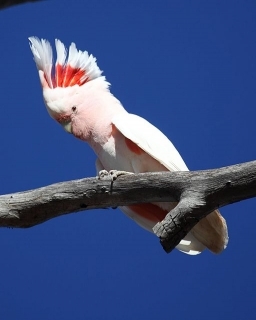 May be found in the company of Galahs (Rose-breasted cockatoos) and Corellas; found in pairs or groups up to 50; will feed both on the ground and in trees. 2 to 4, ovate eggs, 40.0 x 29.5mm (1.5 x 1.2 in).